True to Cal Poly’s Learn by Doing motto, students design their own products and start their own businesses for their senior project. Interdisciplinary Entrepreneurial Senior Design Project I, II and III (ENGR 463, 464 and 465) are completed over a span of three quarters, taken in succession. The classes are a combination of engineering and business students and are advised by biomedical engineering professor Tom Katona, electrical engineering professor Lynne Slivovski and entrepreneurship professor Jonathan York. Students must take an idea and transform it into what has the potential to be “a scalable business” with a budget of $300. Clove, one of the 10 groups, has designed a product that they believe can revolutionize the at-home cooking experience. Members are Mechanical Engineering fifth year Matthew Callaghan, Mechanial Engineering fifth year Alex Decker, Business senior AJ Gankhuyag, Computer Science senior Elliot Kirk, Computer Science senior Andrew Lam, Biomedical Engineering senior Aaron Quinn and Business senior Kieran Scandrett, each with a specialty in hardware, software or business. 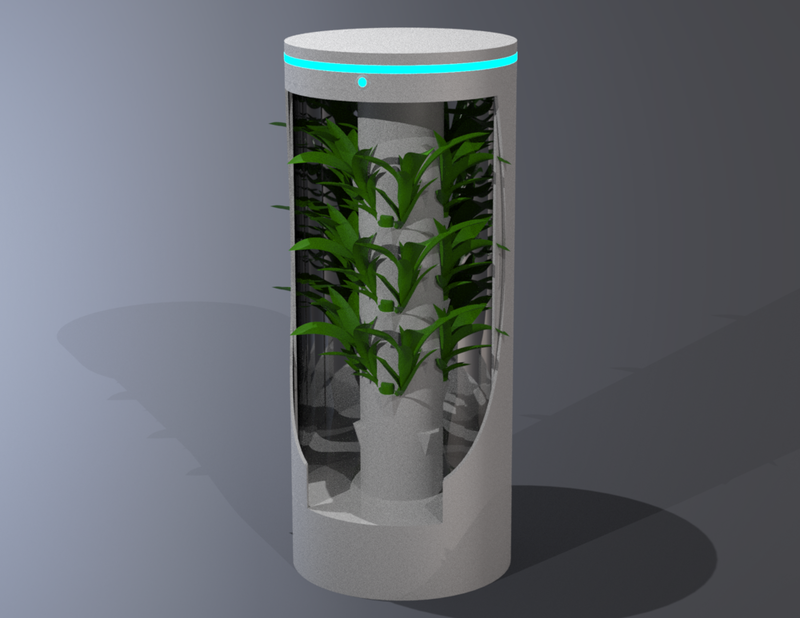 “Our product is a self-contained automated aeroponics tower, a bunch of fancy words for saying it’s a tool that allows you to grow food automatically at home,” Callaghan said. Pantry is a device created for culinary enthusiasts who frequently cook at home. The name was inspired by the concept of a “living pantry.” The Clove team found that those with a passion for cooking typically were not as enthused about the amount of time, effort and money regularly dedicated to buying fresh produce. According to Decker, the kitchen-friendly vertical farm can grow most common herbs and leafy vegetables. While some fruits could also be planted, pollination would be a limiting factor, as Pantry is an indoor device. Scandrett compared the product to a Keurig, but for plants. The small device has 12 spots to place pods with volcanic rock that contain the seeds of a plant. Roots would grow into a chamber that fills with mist, and an enclosed LED lighting system would provide plants with the necessary energy to grow. Due to the optimal amount of water and light available to the plants, they have the ability to grow two to three times faster than they would in normal soil. The only upkeep would involve filling the reservoir as well as trimming and replacing the plants. The team said they agrees that delving into entrepreneurship has been a “really fun” and “really interesting” experience. They found that customer development is a constant process that forces them to reach outside of their comfort zones and have conversations with new people everyday. The project involved a lot of trial and error, and customer reactions identified matters to be improved upon. Clove’s first Pantry design received feedback that it resembled a trash can, prompting them to change the design. “Everyone is just as passionate about making this vision a reality,” Scandrett said. The team also found that they were dissatisfied with the number of email responses they were getting, and after modifying their outreach approach, they saw a 250 percent response increase. “This entire project has been a challenge, but as a group, we’ve made sure that the direction of the group has been, for the most part, a consensus,” Callaghan said. The Clove team is currently in the process of applying for Innovation Quest, which could provide them with more funds, the goal being $15,000, as well as company opportunities. “We’re really optimistic for the future,” Decker said. Pantry is constantly evolving as Clove continues to advance with the design and customer relations. The shift from a preliminary prototype to a marketable final product is in effect and continues to be fueled by innovation.